Story (from IMDB) : While on a tour of the White House with his young daughter, a Capitol policeman springs into action to save his child and protect the president from a heavily armed group of paramilitary invaders. 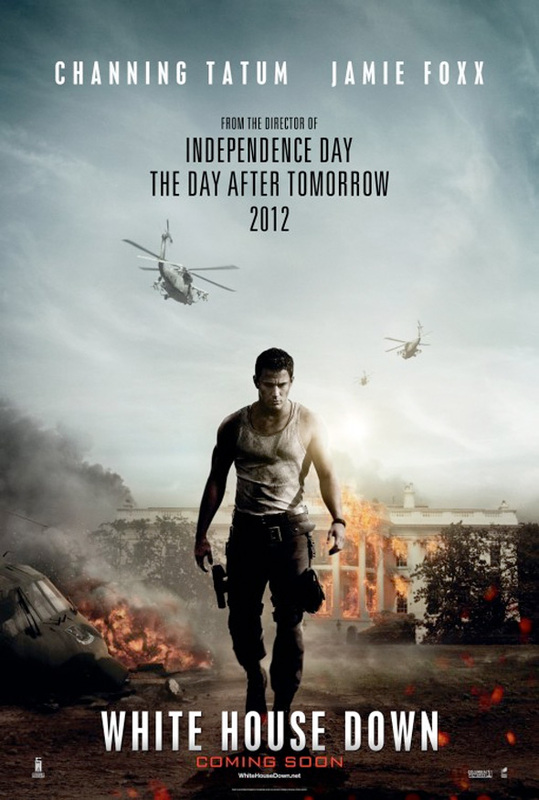 White House Down is turning out to be one of the best summer blockbuster action films this year. Going into it I had mixed thoughts based on the premise and how it would compare to Olympus Has Fallen that was released earlier this year and how having this one be PG-13 compared to Olympus’ R rating would fare for it. Happy to say I more than delighted afterwards. You can’t really expect a deep story going into a film like this though. I could actually write a book detailing the over the top ridiculousness of the plot along with all the huge plot holes involved but I didn’t come into this expecting a deep story. The story follows Cale after a attempt to become a secrete service agent he takes his daughter on a guide of the White House. Soon after terrorists take over the White House while Cale’s daughter is off by herself using the restroom. Cale then goes on a mad dash to not only find and save his daughter but to save the President as well. That alone helps the story flow well enough with the non action sequences giving you enough of some story to at least movie it forward. Without giving away any spoilers either I’ll say the twist and “villain” for this movie though was a huge twist in the wrong direction. It only furthers the point of this movie surely can’t be taken for the story. Thankfully the action is pretty much nonstop for this movie. Something is always being shot, blown up, chased, and punched. It essentially turns out to be Die Hard in the White House. The PG13 rating just makes it as to where you can see someone get shot but you don’t see the blood as to where Olympus Has Fallen had moments of pretty graphic violence. They always make sure you see whatever action is happening as there are no shaking camera moments or many off scene cut offs. For what the action dismisses in realism they easily make up for by making sure that every moment is over the top. Channing Tatum and Jamie Foxx easily are another reason why this film is so enjoyable. Together they have great on screen chemistry and are constantly throwing lines off each other. Their dialog makes the film feel more laid back and comical often with Jamie Foxx coming off as a more laid back president. The rest of the cast however won’t be doing much for you. Maggie Gyllenhaal plays Finnerty who upon turning down Cale for the secret service ends up talking to Cale over a phone for most the movie. Maggie Gyllenhaal seems to pretty much just be playing the same role she always does. In the end though you realize that even with a bad story with tons of ridiculous scenarios and plot holes that the action more than makes up for it. Add two very likeable main characters into the fray and you have a good summer action film. It just ends up being fun to watch and not think about. Well worth a viewing. Reviews, Interviews, News, and more! Please follow for email updates! Enter your email address to follow Apocalyptic Demise and receive notifications by email. Follow Apocalytic Demise for updates!